Make life-long connections with like-minded individuals in the FPE program, where you will apply theory and hone the skills needed to be successful post-graduation. 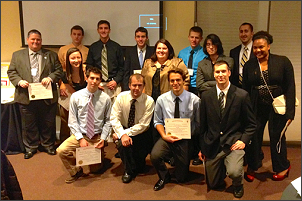 Outstanding students in the program are eligible to join Tau Beta Pi, the national engineering honor society. The University of Maryland Student Chapter of the Society of Fire Protection Engineers is one of two student chapters currently organized within the society. The objective of the organization is to "promote the art and science of Fire Protection Engineering and its allied fields, to maintain a high academic and ethical standing among its members, and to foster Fire Protection Engineering education." The Chapter strives to achieve these goals by sponsoring a variety of activities, including field trips to unique facilities, lectures by guest speakers on topics of relevant or special interest, and a number of social functions. A monthly business meeting is held to keep members aware of current topics concerning the Chapter and the overall Society. Occasional activities are planned to bring students together to exchange ideas. The Chapter constantly strives to promote the Department of Fire Protection Engineering via communication with Society headquarters, representation at the monthly meetings of the local Chesapeake Chapter of SFPE, and establishment of displays at conferences. The National Fire Protection Engineering Honor Society was founded in 1922 at the Illinois Institute of Technology. Dedicated to the promotion and recognition of scholarship, the promotion of original investigation, and the objectives of fraternal association within the profession, the Beta Chapter was initiated at the University of Maryland in 1967. The Salamander Society provides for three classes of membership, consisting of active, alumni and honorary members. The active members are selected from the students enrolled in the Department of Fire Protection Engineering. These members automatically obtain alumni membership upon graduation. Honorary membership is bestowed on individuals who have distinguished themselves in the discipline of Fire Protection Engineering. 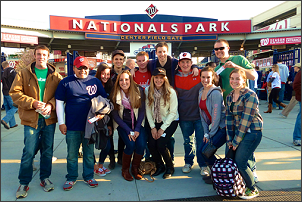 Salamanders attend a National’s baseball game.